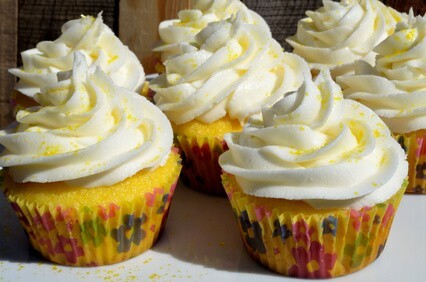 My homemade lemon frosting recipe is a keeper. So fluffy and luscious, you will soon become a fan. In a mixing bowl, combine the softened cream cheese with the lemon juice and beat on low until blended. Add salt, grated lemon and vanilla. Now add the powdered sugar gradually, while beating on low speed. When blended completely, beat at high speed until light and fluffy; approximately 3 minutes. Substitute 2 tablespoons of orange juice concentrate instead of the lemon juice. Of course, you would use orange rind instead of lemon rind. In a mixing bowl, combine the grated lemon rind with the butter and beat until light and fluffy. Add part of the powdered sugar gradually, beating well after each addition. Combine lemon juice and water; add to the creamed mixture alternately with the remaining sugar until desired consistency is achieved. Add salt and mix well.